We’re all about exteriors this season at Blue Door Painting! Our May Job of the Month features a transformative project in Old Irving Park, complete with an overhaul of the exterior color and a facelift for the front deck. The structure of the house was beautiful, but the paint was faded, chipping and peeling away in prominent spots on the facade. 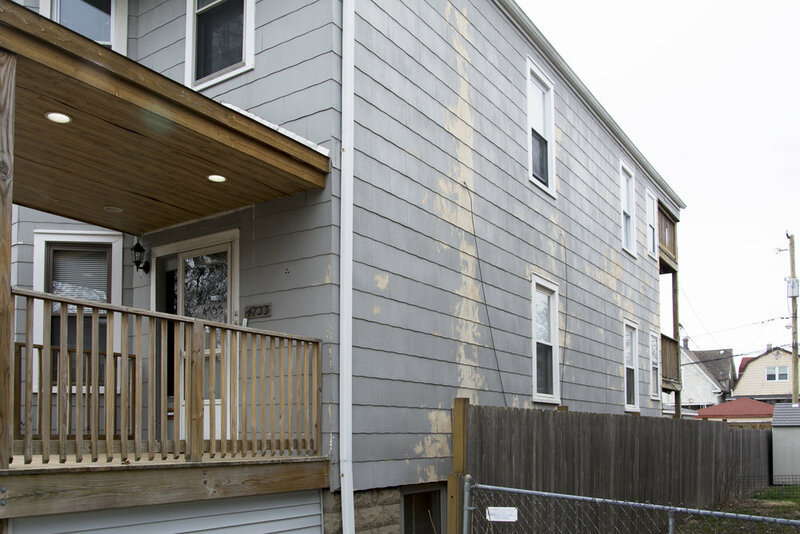 The front, sides and rear of the home were looking worse for wear after a few too many tough Chicago winters, and we needed to smooth things out before starting the color update. To properly prepare the home for this dramatic exterior rejuvenation, we thoroughly cleaned and pressure washed all the exterior surfaces of the home to ensure a long lasting, evenly applied finish. The Blue Door Painting crew then filled any holes and cracks with high quality elastomeric caulk and applied one coat of primer followed by two coats of Hale Navy HC-154 exterior paint by Benjamin Moore. The original bland, unobtrusive gray was consistent with many houses in the area, but the homeowner wanted more than just a spruce - they wanted to stand out from the crowd with a bold color choice. To complete the look, we stained the mismatched natural wood grain of the front deck to a darker, complementary color. We also matched the top of the deck design to the home to give a more consistent appearance to the entry. “Tom and Ed were wonderful to work with, planning the project and scheduling the work. We had a whole house exterior paint job including deck stain. We changed the color of the house completely and they did a great job prepping and painting. I will use them again for sure and I highly recommend them. Oh, and their prices were very competitive and fair.” - Beth O. on Google Reviews. Blue Door Painting is a fully insured and vastly experienced exterior painter. Contact Blue Door Painting today to get a free estimate for any painting project – we are fast, professional and affordable!